From tiny rats and bats to giant elephants and blue whales, this great mini animal book will soon make you a mammal expert. Did you know that a common dolphin doesn't breathe more than three times a minute? Or that the trunk of an elephant has over 40,000 muscles, but no bones. No? Then this is the book for you! Find out everything you need to know about almost 200 mammals - what they eat, where they live, and how big they are - in this amazing animal encyclopedia. Packed with pictures, Pocket Eyewitness Mammals makes learning fun using bite-sized chunks of information, including amazing stats and record-breaking facts about the fastest, heaviest, tallest, and loudest mammals.Ideal for school projects and homework assignments, Pocket Eyewitness Mammals is the perfect guide for young animal-lovers.From tiny rats and bats to giant elephants and blue whales, this great mini animal book will soon make you a mammal expert. Did you know that a common dolphin doesn't breathe more than three times a minute? Or that the trunk of an elephant has over 40,000 muscles, but no bones. No? Then this is the book for you! Find out everything you need to know about almost 200 mammals - what they eat, where they live, and how big they are - in this amazing animal encyclopedia. 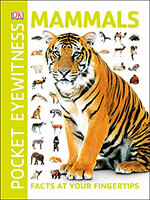 Packed with pictures, Pocket Eyewitness Mammals makes learning fun using bite-sized chunks of information, including amazing stats and record-breaking facts about the fastest, heaviest, tallest, and loudest mammals.Ideal for school projects and homework assignments, Pocket Eyewitness Mammals is the perfect guide for young animal-lovers.